Chastain utilized 3D laser scanning technology to safely and accurately catalog current conditions before electrical and lighting improvements began at the Illinois State Toll Highway Authority M-1Maintenance Facility Salt Barn in Alsip, Illinois. 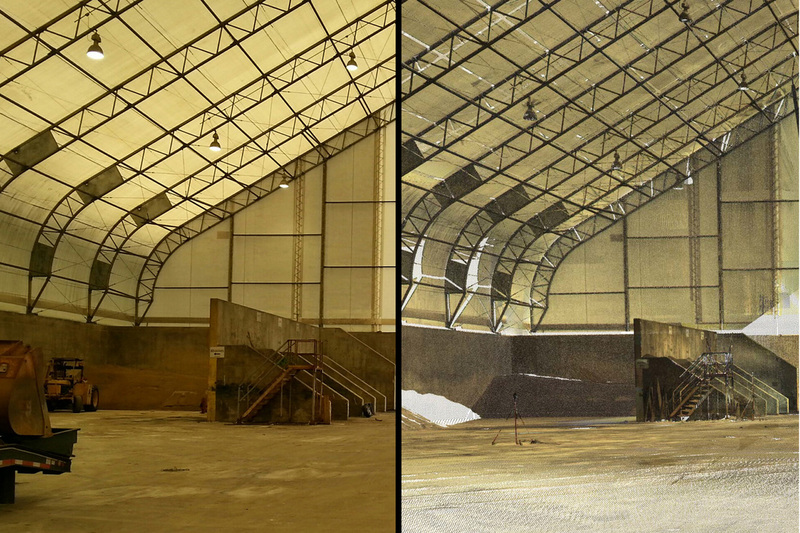 The photo on the left is an actual photo of the interior salt barn, and the image on the right is the 3D digital model created from the scan. Safety and accuracy are two major components needed in the engineering design world. 3D laser scanning scanning (aka High Definition Survey) offers more efficient retrieval times, safer measuring methods, more accurate results, and is quickly becoming the standard for data collection of existing utility facilities and infrastructure.